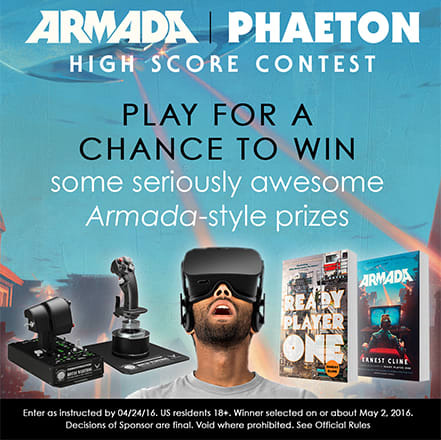 PROMO: Play to Win the ‘Armada’ PHAËTON High Score Contest! Ernest Cline’s 2011 book Ready Player One took the Sci-Fi world by storm and will soon become a major motion picture directed by Steven Spielberg. Now, Cline is back with another epic tale in his book Armada, currently available in paperback. Armada centers on high school student Zack Lightman, who one day looks out his classroom window to find a UFO hovering that’s straight out of a video game he plays every night—a game called Armada. It turns out that Armada was actually developed by the Earth Defense Alliance (EDA) as a training simulation for a secret alien threat, and is being used to identify gamers that are best equipped to fly a special mission to help save Earth. Now, just like in the book, you have a chance to play your way to victory in the Armada/PHAËTON high score contest. One lucky—and skillful—Grand Prize winner will take home an amazing prize package that includes an Oculus Rift virtual reality headset, Thrustmaster Hotas Warthog Joystick, copies of Ready Player One and Armada and a limited edition Armada poster—all signed by author Ernie Cline—plus a set of all three embroidered Earth Defense Alliance patches. Nine runners-up will also receive the signed copies of the books and poster, as well as the set of embroidered Earth Defense Alliance patches, and everyone who plays and gets at least 525 points will get an embroidered patch of their own! Entering is easy. Just go to Phaetongame.com/game to play the game in your web browser (not in a mobile app). When you score at least 525 points, you can then enter your name on the game&apos;s list of high scores. Take a digital photo of your name when it appears on the high score list and post it to your Facebook, Twitter, Tumblr, Instagram, or Pinterest account using the hashtag #ArmadaBookContest, and then fill out the contest entry form at ArmadaBook.com/contest. The Armada/PHAËTON high score contest is only for a limited time—from April 11 through April 24. So, don’t wait—get your game on now!